Alice Stuart, folk singer, decided to become Alice Stuart, electric guitar player, during the several months she spent in the Frank Zappa blues band To this day, Alice's fans are divided into two camps: her electric fans and her folk fans. But not unlike Bob Dylan, Alice Stuart has followed her own musical star, sometimes performing a folk song with her electric and sometimes going unplugged all together. To this day, Alice's fans are divided into two camps: her electric fans and her folk fans. But not unlike Bob Dylan, Alice Stuart has followed her own musical star, sometimes performing a folk song with her electric and sometimes going unplugged all together. Today her band, The Formerlys, represent a gathering of some of the mainstays in the Pacific Northwest music scene, and their latest CD, Freedom, reflects the genre defying blend of styles and influences which are the hallmark of Alice Stuart's musical heritage. Alice Stuart began performing in Seattle in the early 60's and quickly became one of the preeminent names in the local folk scene. In l964 Alice was introduced at the Berkeley Folk Festival and was warmly received into the company of many national folk luminaries, which as Joan Baez and Mississippi John Hurt. That same year, Arhoolie Records released All the Good Times, Alice's first LP. Patty Hall, a writer, recalls seeing Alice perform and recalls, ?To see a woman, only a few years older than ourselves, singing with such confidence and playing with such proficiency, was transforming.? Like Memphis Minnie in another time, Alice Stuart cut her own road following the songs and the performers she loved. : ? I loved classical music as a kid. I was also heavily influenced by Hank Snow, Hank Williams. Buddy Holly and Elvis and Roy Orbison, The Everly Brothers & Ivory Joe Hunter. About a year after I picked up the guitar (when I was 19) I heard Joan Baez. Lovely voice and great guitar playing. I was heavily involved in playing 'real' folk music from the British Isles, Ireland, Scotland, etc. Peter, Paul and Mary were No-no's in my crowd Even though they did some traditional songs, they did the pop version. I was also hearing some of the old records from the 20s and 30s from people like Blind Willie McTell, Bessie Smith and Rabbit Brown. This music really reached in and grabbed me like nothing else had. Alice wrote all the songs for her landmark recording for Fantasy Records, Full Time Woman, (1970). In 1972 her second album was entitled, Believing, on this she performed a version of Blind Willie McTell's ,Statesboro Blues, a tune which many would say is her signature tune. 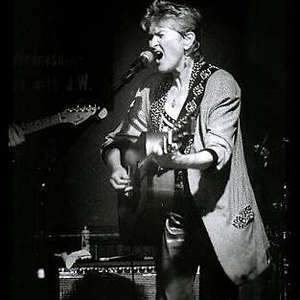 In 1999, Alice again re-recorded Statesboro for her come back CD, Crazy With The Blues (Country Con Fusion). On Crazy, Alice returned to her folk roots and recorded her version of Bob Dylan's, One Too Many Mornings and continued her love for country music singing Chris Wall's, I Feel Like Hank Williams Tonight. But it was not until 2000 after she returned to the Pacific Northwest that Alice Stuart began to receive the recognition of her many years of trail blazing work. In 2002 Alice co-produced with Terry Robb for Burnside Records, Can't Find No Heaven, which was warmly received by the critics as ?her come back album?. The CD was voted best northwest recording by the Washington Blues Association in 2003. In 2004, Alice was voted into the WBA's Hall of Fame. In 2005, she received the best songwriter award and in 2006 her band, The Formerly's, were voted best blues band..
Also in 2006, Alice released her first live performance CD of her career. The album, Live at the Triple Door was a two CD set again released on her own label. With the release in 2007 of Freedom, it appears Alice Stuart's career has come full circle. This CD was produced by long time friend Jim Gaines and was recorded in Memphis using Steve Potts on drums. Here Alice includes one song by Johnny Cash, one song by Bob Dylan, two songs by her band mates, and two songs from The Formerly's. It would appear that at sixty-five, Alice Stuart has got the freedom to do the music she most loves.